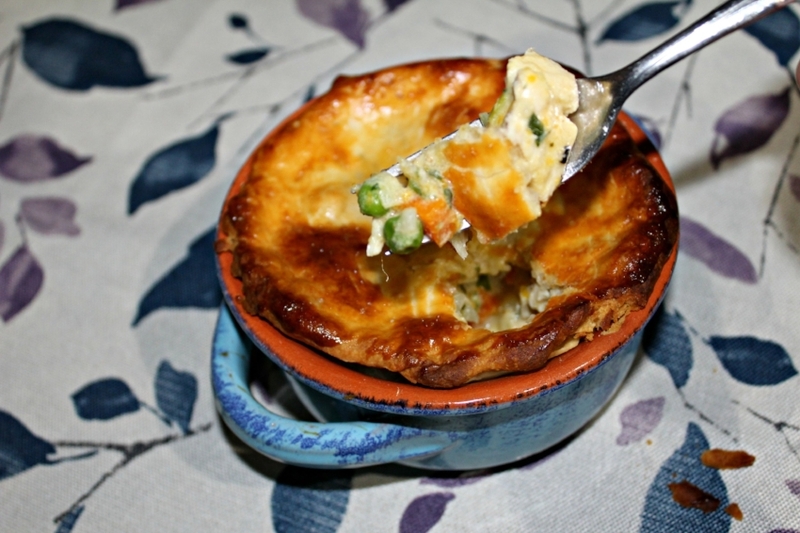 Chicken Pot Pie is one of those dishes that sticks to your ribs, even on the coldest of days. It’s hearty, filling and has everything but the kitchen sink. It’s also a fantastic way to use up any leftover chicken or maybe that turkey you’ll be having a little too much of later this week? Other than the meat, the sky's the limit where vegetables are concerned. Use whatever you have on hand. Traditionally, chicken pot pie includes carrots, celery and peas. This recipe gives it a bit of a fall twist with diced squash and fresh corn. Chicken Pot Pie isn’t hard to make but it is easy to mess up. Mistake #1, do not put the pot pie in the oven if the vegetables are raw. You want them to completely cook through so that by the time it goes into the oven, the liquid will have released from the vegetables. Otherwise, you’ll get a watery pot pie and no one likes that. Mistake #2, do not forget to set a timer. Set your timer for the lowest amount of time the pot pie will need to bake. Check the pot pie when the timer goes off and check every five minutes or so until the crust is golden brown. Otherwise, I can guarantee your pot pie will burn. To add extra flavor and change things up a bit, I added quite a few extra veggies. For starters, leeks add great flavor to any dish. Halve them and slice ‘em up and they’re good to go and they soften up just like onions. Butternut squash is an extra boost of nutrition and it adds more texture to the pot pie. You only need about a cup so be sure to plan another meal within a few days that also uses butternut squash. It’s important to make sure the squash is fork tender before moving on to the next step. It will release a lot of liquid while baking if the squash is still hard. Finally, add the corn and peas. You can use frozen but with corn being in season and abundant this time of year, I recommend using fresh ears of corn. It’s easy to shave the kernels off. Stand the ear of corn upright in a large bowl or on a large plate and use a chef’s knife to shave the kernels off. Check out the full recipe below and let me know what you think! 1 - Preheat the oven to 425 degrees. Melt the butter in a medium pot or large, deep skillet. Add the carrots, onions, leeks, squash, herbs, salt and pepper and cook until softened. Whisk in the flour, cooking until golden. 2 - Add the chicken and corn to the pot and slowly add in the stock. Stir continuously at first to avoid clumps and then let simmer 15 minutes. Add the milk and bring to a low boil. Simmer for 12-18 minutes until the veggies are tender and the liquid has thickened. Taste and adjust seasoning as necessary. 3 - Knead and separate your dough into two round discs, one should be about ⅔ of the dough and the other ⅓. Cut each dish into four even pieces. Starting with the larger chunks of dough, roll each out into a circle until it’s about ¼ inch thick. Line the ramekins with the larger pieces of dough, save the smaller ones to top the pot pies. 4 - Pour the mixture evenly into each ramekin. Top with the remaining pie dough and pierce each a few times for ventilation. Brush the tops with egg wash (one egg beaten) and bake 20-30 minutes until the crust is golden brown. Let sit 10-15 minutes longer to cool before serving.